It is an infectious disease with fever, sore-throat and red rash. Eruptions appear in the form of bright red (scarlet) blotches. Eruptions appear, the first day on the face and neck; the second day on the breast and region of the stomach and the third day on the arms, hands and limbs. It generally terminates in five or six days. Belladonna is the specific remedy for this disease, which is cured by its use alone, except complicated cases. Intense heat, burns the hand. Throat bright red, painful, swallowing difficult. It is also prophylactic to scarlet fever. 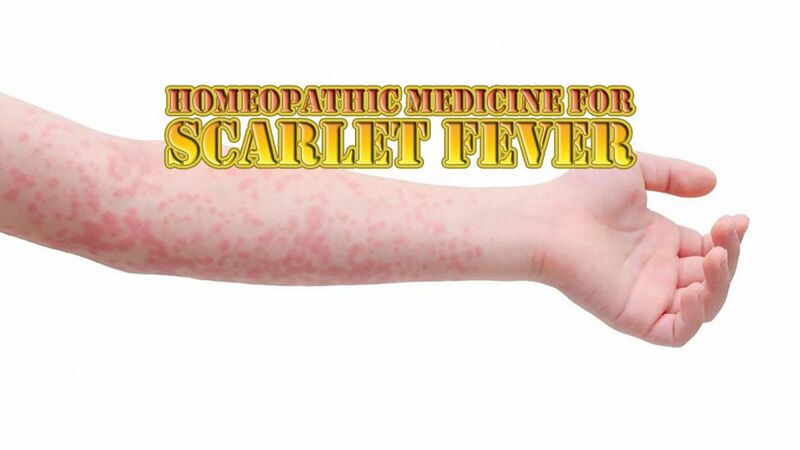 R.T. is most useful remedy in a dynamic (attended with great debility, prostration) forms of scarlet fever. Child is restless and drowsy. Tongue red and smooth with triangular red tip. Eruption doesn’t come out well and when it does come out it is miliary. Great inflammation of throat, with sharp stinging pain. Worse from warmth, wants covers off, a cool, room (reverse of Bell., Bell. wants warmth). Am. carb is also a useful remedy in scarlet fever. Throat swollen internally and externally. The tonsils are swollen and bluish. Lach. is useful in advanced stages of scarlet fever. It suits cases more a dynamic than those calling for Rhus Tox. The child is drowsy and the rash comes out imperfectly and slowly. Throat inflamed, worse left side, may extend to right. Tongue is dirty yellow purple face. It is useful in severe cases of scarlet fever. Irregular, patchy eruption of very livid color. Tonsils swollen with deep ulcers. Stools thin, bloody and offensive. Often indicated in dropsy after scarlet fever. Tardy development of the rash, occurring in blotches and resembling that of measles or a disappearing rash. Tongue coated yellowish, dark brown. Thirst for large quantities of water at long intervals. Sharp pain in chest while coughing. Patient lies quietly, doesn’t want to be disturbed.